Hit your abs from all angles with these stomach sculpting moves. To really sculpt your abs and get them rock solid you need to hit it from every single angle. And what better way than to use a medicine ball. Originating from Persia over 3000 years ago and continued to be used in ancient Greece for injury rehabilitation, medicine ball work is one of the oldest forms of strength and conditioning training. As well as helping with injuries, the medicine ball can help tone your core muscles, - the body’s center of power. 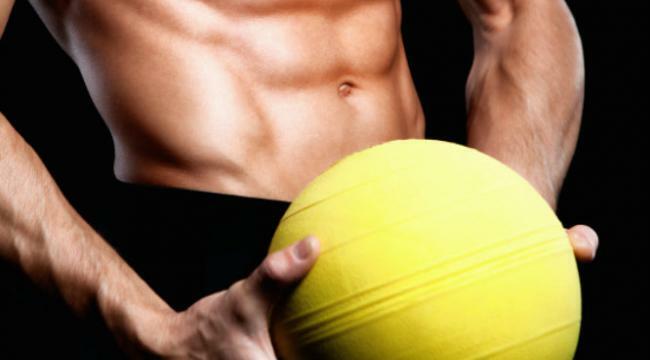 Using a medicine ball to train the core is perfect because you can perform so many functional movements similar to those that you do in everyday life. Make sure you're are on your knees and back to back with a partner. Keep your abdominals contracted and maintain perfect posture. Slowly twist to one side and pass the ball off to your partner. Return to the other side to retrieve the ball. Continue for 30–90 seconds, going one way. Repeat, going the other direction. Tip: This can also be done while standing.